Patch panels: This is the connection point for drop and patch cables in a network infrastructure. 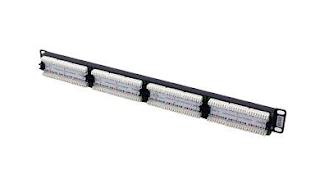 Typically it consist of one or more rows of RJ45 or other connector drop point, where the end connection is terminated and up link to the network. A patch panel is located at the local area section of every network (LAN), and is a mounted and assembled as a hardware infrastructure that contains ports used to connect and manage incoming and outgoing LAN signal carrying cables. Patch panels are mostly located and mounted inside the network rack, either above or underneath a network switch. Patch panels are also referred to as patch bays, patch fields or jack fields and are also commonly used in radio and television. Patch panels can be based on the number of ports they contain. Patch panels are also designed for specific cable specifications. There are specific patch panels for unshielded twisted pair (UTP) and shielded twisted pair cables. 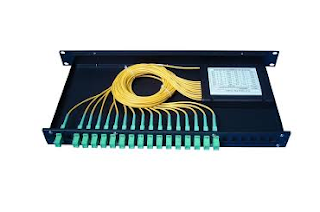 Patch panel comes usually in the following count of ports, cable type or rack specifications. In conclusion we must consider a Patch panels as a very important tool of any interconnected network. More especially, patch panels serve as a network’s central location for monitoring and connecting point. Often times, they’re used to connect and disconnect networking facilities. We can think of a panel as a traffic signal, it’s the traffic signal that monitors and controls the flow of traffic through its intersection. A patch panel is an absolutely critical component for uptime, performance, speed and other important characteristics of any network. For a particular network to be fully integrated and accessed by the users, the patch panel will really play a big role.